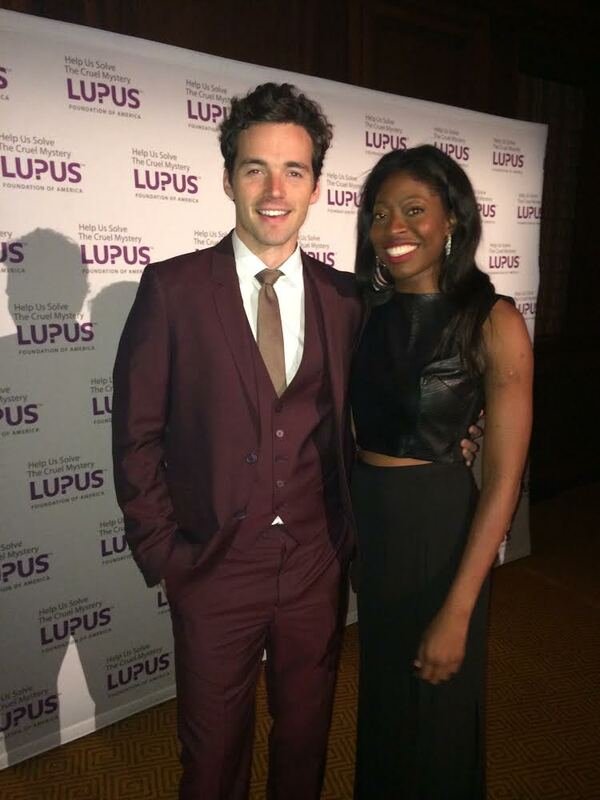 Ewo Harrell and actor Ian HardingAs a committee member for the Lupus Foundation of America's (LFA) Walk to End Lupus Now Tampa and Education Committee, Ewo Harrell, 2014 winner, was invited to attend LFA's annual Gala in New York City. Titled "Evening of Hope", the annual event honors outstanding individuals who have been champions for those living with lupus and their families. It raises critically needed funds to support LFA's mission and its programs to fight lupus. Ewo took advantage of the opportunity by sharing her story with many of the attendees. The gala is known for honoring key members in the lupus community. This year, noted members included Agent of Shields producers Maurissa Tancharoeb Whedon and Jed Whedon, and Dr. Iris Loew-Friedrich who earned the Barlin Family of the Year Award and the Corporate Leadership Award respectively. Also in attendance were LFA's Global Ambassador Julian Lennon with his friend Whoopi Goldberg, and actor Ian Harding (right) who works to raise funds and awareness for lupus research and education.